Tania Dibbs is a professional painter and sculptor who lives and works in the Roaring Fork Valley of Colorado. She attended the University of Virginia from which she graduated with a Bachelor of Arts degree in fine art and biology. Her love of nature and the natural sciences is evident in her work, which revolves around issues of the intersection of humans and nature. Her art studies have taken her to the SACI Art Institute in Florence, Italy, the Art Student's League in New York, and the Anderson Ranch Arts Center in Snowmass, Colorado where she won an Aspen Foundation grant to fund her painting study and an Artists' Fellowships for Colorado Artists award to study steel sculpture. Her honors include a Visual Artist Fellowship Award from the Colorado Council on the Arts and an Art in Public Places selection from the state of Colorado. Tania will be visiting the Arctic Circle on a residency program this fall. She has had one-woman and group shows in Aspen and across the United States, and her work is in collections worldwide. My sculptures explore the jagged intersection between the natural world, humanity and culture using found objects, resin, beads, glass, and jewels. 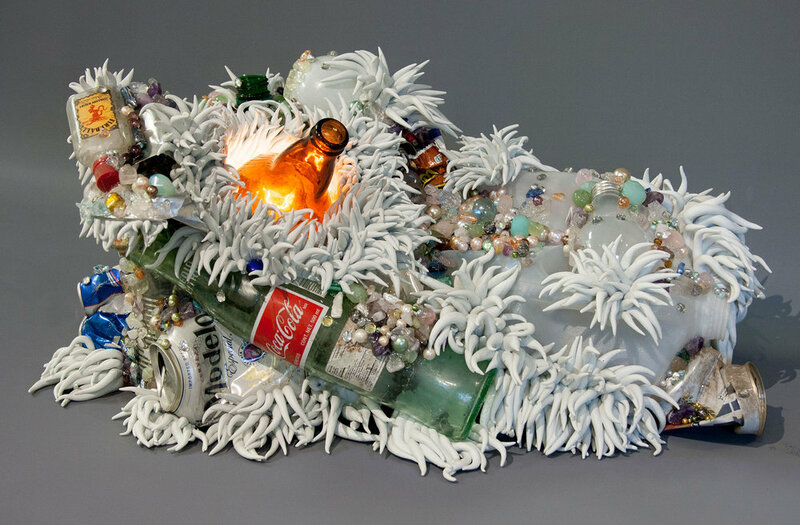 Using the type of human debris that has become invisible to us makes a statement about our disposable lifestyle. Combining symbols of wealth and culture with their opposites highlights a bigger discussion about our fast-changing relationship with the planet and with nature in general. In these pieces, an obscene abundance of sparkle and glam adorns the object while nature still inexorably morphs, evolves, and continues regardless of conditions.